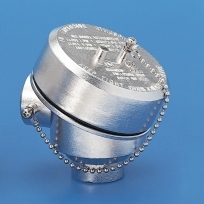 IME Model 1080 Series Stainless Steel Thermocouple Heads are designed specifically for explosion proof applications and constructed out of SS316 to withstand applications where aggressive atmospheres prevail. This housing accommodates a terminal block or head mounted transmitter 50mm (2.0″) in diameter that can be mounted using M4 screws. Some units as indicated has a provision for a customer designed SS nameplate with information such as model number, company name, logo, and website. © Copyright 2017. International Metal Engineering Pte Ltd. All Rights Reserved.